Hello and welcome to another edition of Sealed Success! I do apologize for my unexplained absence these past two weeks, I had a bad case of allergies and some less than ideal health issues afterwards that prevented me from making videos at a working capacity. I'm almost back to my old self but at the very least I'm at a point where making videos is a possibility. For this week and perhaps the following week I'll be doing recordings of replays where I deem necessary if I feel it's a better option for my voice and health. My voice does get a little hoarse still if I talk for an extended period of time and the ability to do replays while not something I like doing, is an option I have to allow myself to do in this instance. As soon as I feel I'm able to talk normally I'll do away with the replays and resume live play. The schedule I've presented below is tentative and can be subject to change should anything occur that is outside my control. As a way to ease myself back into videos I only did videos for my draft league and the second sealed league. Starting next week I should be back to a normal slate of videos as I'll finish up the first and second sealed leagues along with me tackling a new Magic 2019 draft league. In place of the videos for the first sealed league instead I'll be taking about my thoughts on Chaos Draft, a format coming to Magic Online at the end of August. 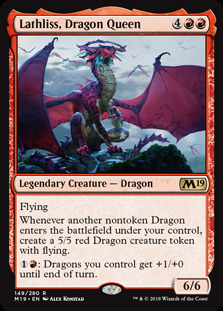 I'll be drafting the format at least twice in place of Magic 2019 and may have more drafts in reserve should I need them to fill a week or two. With all that said, let's begin! When I read the announcement of Chaos Drafts coming to Magic Online I was very excited about the prospect of drafting my favorite format of all time. If the option every arises to have a chaos draft, I am all for it above any other draft format. The sheer randomness of it all is quite fun and makes every pick unique and more important than in a traditional draft environment (even more so when you add Conspiracy and/or Un-sets to the mix). I tend to do very well for myself in chaos drafts and it doesn't matter how familiar I am with the sets the cards come in due to how I draft and what I'm looking for early on in the packs. 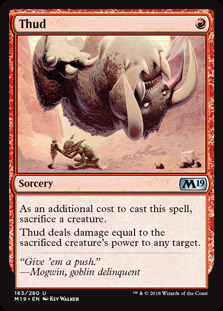 Normally we like to think of drafting using the B.R.E.A.D acronym (Bombs/Removal/Evasion/Aggro/Duds)*, but I find in chaos draft it's not always best to think that way because of the situation you find yourself in. Synergy is hard to come by in chaos draft so I tend to ignore it altogether and set myself up to draft a "good stuff" deck no matter what colors I'm in. 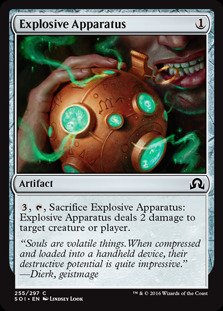 I don't prioritize bombs or removal over the other, I'll draft whichever comes first with the caveat that I lean towards removal more often than not. 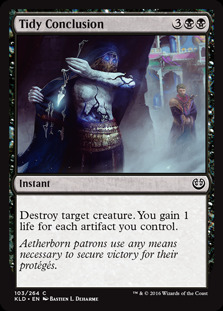 I'm happy to first pick cards like Tidy Conclusion , Liturgy of Blood , Luminous Bonds , Pacifism , Dwindle even if sometimes they're expensive/clunky to start off with. You might not always be able to block or attack past whatever random threats they have, but more often than not you'll be able to stab it. Bombs have to be individually strong for me to take them over a common removal spell so you won't see me take a Reality Smasher type card first (needs other cards to make it good) but you will see me take a Baneslayer Angel type card first (always good no matter what). Evasive threats tend to be fliers but creatures with unblockable, deathtouch, or the ability to deal damage outside of combat work as well. I value these cards highly because sometimes you find yourself in a board stall and you need ways to push through and give yourself an advantage. 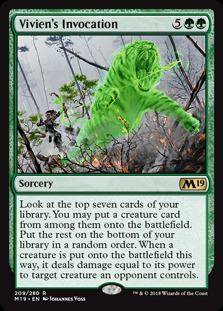 At a very basic level you can assume you and your opponent can use creature combat/sizing as a "removal" spell of sorts: Wall of Mist doesn't kill Centaur Courser but Centaur Courser 's role on offense is negated now. 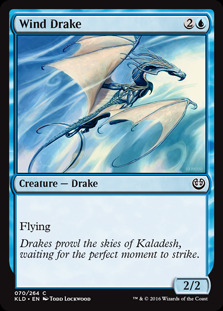 To work one level above that let's say you have a Wind Drake facing off against Wall of Mist . 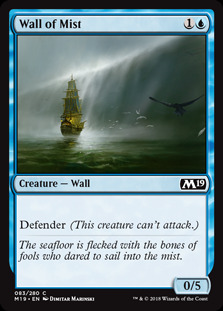 Wall of Mist is negated as a good defender and Wind Drake becomes a much more potent threat, forcing your opponent to find an answer or take damage every turn. All things being equal, evasive threats force your opponent to make a play otherwise they lose parity/advantage on the battlefield. Once the evasive threats are gone/not available, I look to take efficient creatures to help beef up my deck. You can consider these to be french vanilla creatures and/or creatures that have good sizing for the mana cost. 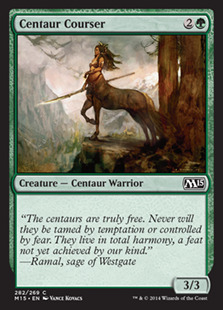 Centaur Courser is the easiest example of a creature with good sizing for the mana cost (3/3 for 3 mana). You can also group pingers, tappers, and mana dorks in this category as well. At this point you're looking for good role/curve fillers to help fill out your deck. Lastly once you can't take anything good you take whatever else is left. When you're at this stage of drafting you should already know what color(s) you're in so make sure to signal appropriately. 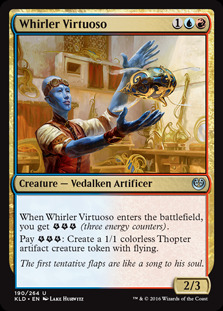 Hate drafting is not useful here, you want to be sure you're getting the best cards within the colors you've chosen. 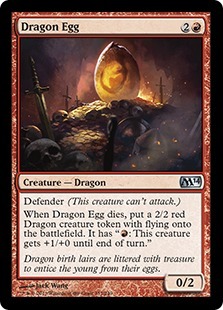 Unless it's a card you can't beat ever, stay way from drinking the haterade and focus on sending the right signals and taking sideboard/niche cards for your deck. Much like league style drafts you need to give yourself the best chance at having access to the best cards for your deck and you deny yourself that when you hate draft or stray from your original plan. This line of thinking has served me well and hopefully it serves you well when you encounter a chaos draft of any variety, be it full mystery grab bag or Standard legal sets chaos draft. What do you think? How would you approach a chaos draft? I certainly didn't mean to draft almost exclusively creatures, it just so happened to work out that way. 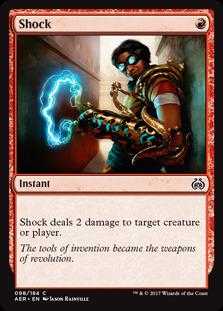 Looking back on the draft once I got out of pack one I didn't see any removal at all, and this is with me not counting Shock and Explosive Apparatus as removal spells. There was a Thud I could have taken but I feel in most instance you're using that as a burn spell as opposed to a removal spell in RG, so in my mind it didn't register as a removal spell to me. I did keep looking for any signs of removal spells that I could call removal but they did not end up coming my way so I had to make do with 20 creatures in my maindeck. 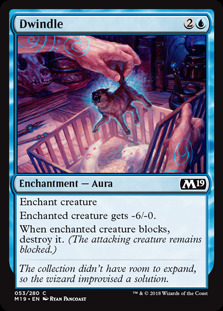 It's a bit of a depressing feeling knowing you can only draw creatures in your deck, but you also know you can't draw a removal so you can't play towards that out. Removal in this deck became attacking/blocking and having a bigger bomb than my opponent. If my opponent had removal and/or had an advantage in combat there's nothing I could do about it, but it doesn't mean they'll play knowing they definitely have the game locked up. Lathliss, Dragon Queen ended up being key for me going 2-1 as it completely took over one match and was the reason I won that match to begin with. Lathliss into multiple Dragon Egg s was quite absurd as even if I lost Lathliss I still have 10 power in the air and even if I lost all my flying dragons I could get new ones if my Dragon Egg s died. After looking at all my options and what I knew the B/R deck could do I decided to not make any changes to the deck and ran it back for the next stage. My other options weren't as good and they would have made me work harder for my wins as opposed to playing dragons and removal to beat my opponent quickly. That's how the games played out in the first two matches with me able to get on board quickly and use dragons to push my advantage but it didn't work out as well in the last match. My opponent was able to slow me down in the first game and then take over with Pelakka Wurm and Vivien's Invocation , while in the second game I was stuck on one Mountain when I needed a second red source to deploy my dragons and I lost soon afterwards. I took an aggressive approach in the second game when I used a Lich's Caress on a Gravedigger to get in for 6 damage to leave my opponent at 6. It was a gamble but the thing is I'm not completely out of it if I don't hit a removal/they play two creatures. 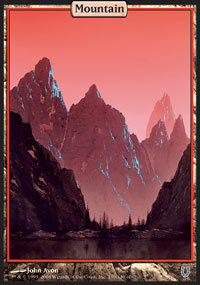 At 6 life I can draw Mountain and any dragon to force my opponent to have another answer or I take the game. 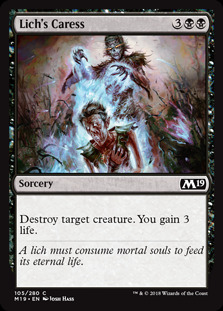 Using Lich's Caress gives me an out to win by putting my opponent in a low life total, but by holding it I'm playing to survive, which is a losing proposition given what happened in the first game. 2-1 record isn't bad and I look forward to at least matching it again next week. All things considered I did pretty well with the 20 creature deck and with my BR deck that I made absolutely no changes to even after opening a pack. There are a few cards that might make it into the deck but I wouldn't be surprised if I ran back the same 40 again for the third time. The deck is good at what it does and the two packs I've opened haven't been kind to the deck. I've gotten marginal cards in the first pack and some okay ones in the second. 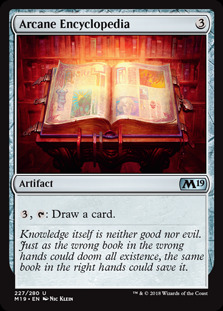 Arcane Encyclopedia could be a maindeck card if I feel it works well with what the deck wants to do, or a sideboard card against removal heavy decks. If you have any comments, questions, or concerns leave them in the comments section below. You can subscribe to my YouTube channel here where you can find all the videos posted early along with content exclusive to the channel. The channel has been barren for the past two weeks but I'm working to slowly get it back up and running like it used to be.